DO YOU HAVE ACHES AND PAINS, INSOMNIA, CHRONIC PAIN? Many of you love saunas and hot tubs for the heat. The heat relaxed your muscles and make you feel good. 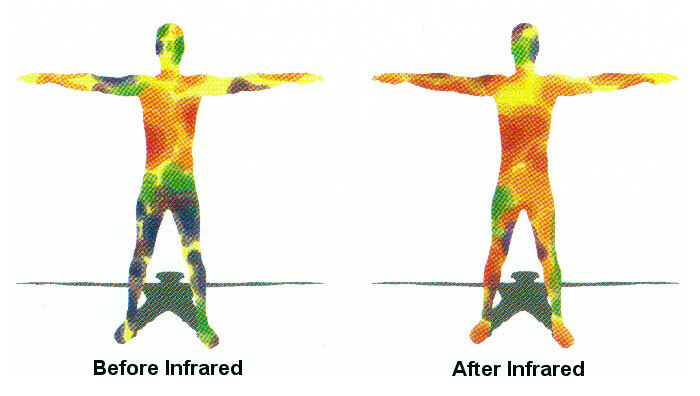 Imagine if that warmth could help improve function of your body. INFRARED sauna therapy enhance your body's function by increasing circulation and reducing inflammation by increasing the release of nitric oxide. Nitric oxide which enhances blood flow bringing oxygen and nutrients to your aching muscles and tissues to promote healing which reduces pain and inflammation. So, infrared therapy helps your body naturally remove toxins through the body's natural filters the lymphatic system , kidneys and liver. Many users of personal infrared saunas report improvement in their symptoms of INSOMNIA. Weight loss is enhanced by the infrared sauna because it increases the core body temperature enhancing the body's ability to burn body fat. See time magazine article "Are infrared saunas healthy" September 7, 2016. ARE YOU LOOKING FOR A UNIQUE PIECE OF EQUIPMENT? TIRED OF TREADMILLS? GET A GREAT WORKOUT IN A FRACTION OF TIME! Dr. Williams collaborated with HELIX to create the Athletic Edge REHAB 360 for aerobic fitness, preventing and rehabilitating sports injuries. THE REHAB360 IS ONE OF THE MOST CHALLENGING FITNESS/REHAB EQUIPMENT YOU WILL EVER USE and will work muscles you don't normally work on a treadmill or elliptical. The REHAB360 strengthens the inner and outer thigh, hamstring, quadriceps and abdomen simultaneously! REHAB360 will stabilize knees, hips, reduce lower back pain, and strengthen muscles while maintaining aerobic fitness. It Is the only device that stabilizes the pelvis and knees in 360 degree range of motion. It is the best low impact exercise for your knees. Check out our page on the Helix 360 on our website.